Targeting the millions who love nature and the national parks, this elegant interpretation of Ansel Adams's celebrated wilderness photographs offers a modern tribute by photographer Peter Essick, whose 2011 story on the topic in National Geographic magazine was one of the highest ranked that year. 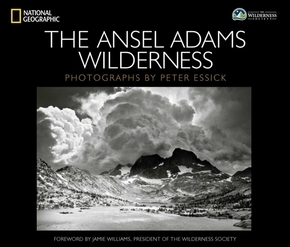 In this exquisitely photographed and affordable keepsake book, esteemed National Geographic photographer Peter Essick pays tribute to Ansel Adams and the craggy California Sierra Nevada wilderness area named in his honor. Like Adams, Essick aims to instill respect for the awesome yet fragile beauty of the High Sierras; the stunning images in this book reinterpret this powerful landscape through the modern lens of digital photography. Interspersed with illuminating words from prominent naturalists and conservationists, these photographs offer a new view of one of the country's most timeless and striking national parks. Elegant and evocative, this modern tribute to one of photography's greatest masters will be treasured by camera buffs and nature lovers alike.